Sportsmanship or as I call it with my classes, "Sportsmanwomanship" is something I highly value and I work hard to instill the message into my students. I want them to learn how to win like winners, and lose like winners. Everyone wants to win and when a person or team is winning you don't necessarily see their true colors. It is when they are down, disoriented, low that you really see what people/teams are made of. I want them to understand that winning and losing is part of life and sometimes we can't control the outcome, however we can always control how we react to the outcome and how we decide on what happens next. This is a very powerful lesson! Sportsmanship is about respect, discipline, patience, empathy/compassion, and about making it a positive habit. It takes time for students to understand it's importance, and to learn to control their emotions. Keep teaching your students to be the best they can when they are winning and losing so they can take the lessons of "gym" into the rest of their lives! My family and I love to go to Garage Sales (Awesome App linked below for some Saturday Morning Fun) and find awesome treasures (aka- junk, aka- stuff we don't need). Often times, I find a lot of things that I can use in my gym with my students (trophies, remote control cars, floor mats, letter tiles, etc.). I came across this shield that I bought for a quarter and it sat in my office until I had a brainstorm of an idea! I took the shield, printed out some cool lettering, laminated it and the rest was history. 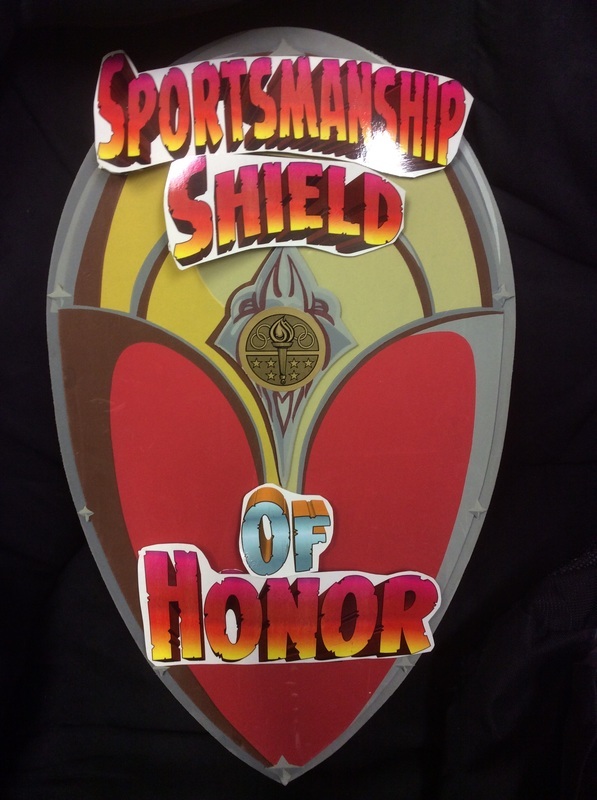 The Sportsmanship Shield of Honor was created and brought to life. Basically, anytime I see a student going above and beyond in my class (effort, teamwork, compassion towards other students) I break out the shield, make a big deal (music, sound effects) as I get on a knee and present them with it. I then take their picture as they hold the shield and pose in their best superhero stance and I post them in the hallway for the entire school to see. It has been a great addition to my rewards arsenal and it has been awesome to watch students light up when they are praised for stellar behavior! What is sitting in your office that you can bring to life?